First thing, thank you Boise, Idaho and ConvertKit for treating me so well. 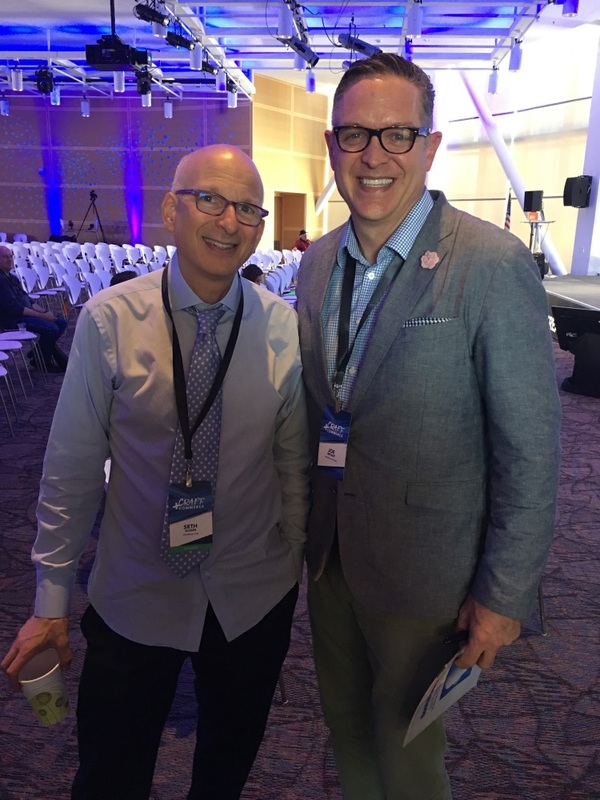 I especially had a fun time yesterday meeting one of my heroes, Seth Godin. I bought an audio cassette business course from him back in 1999 and much of what I learned from Mr. Godin I used to start Footballguys. I had the good fortune to meet him yesterday at the ConvertKit Conference and it was fun to tell him what a positive impact he's been on me and Footballguys. Let's get to Football. It's a new week and we've got new articles plus the News and Notes you need so let's do this. You'll hear us talk a lot about VBD or Value Based Drafting here at Footballguys. It's been a cornerstone of what we do since I introduced it years ago. Here's an updated overview on the basics and how you can apply it. Or even better, how we can help you apply it with Footballguys. Our Footballguys Player Spotlights are deep dive looks into how we see a player performing this year. For this one, our Justin Howe breaks down Melvin Gordon. Our Footballguys Player Spotlights are deep dive looks into how we see a player performing this year. For this one, our Dave Larkin breaks down DE Derek Barnett. 2. TB - QB Jameis Winston destined for a big leap in 2017? Cleveland Browns QB DeShone Kizer has a chance to be the Week 1 starter if he can perform well during training camp practices and preseason games, in the opinion of The Cleveland Plain Dealer's Mary Kay Cabot. That's not outlandish to predict at this point of the year. Kizer was drafted in the second round with the idea that he could potentially develop into a starting quarterback. He's mobile and has a big arm, but Kizer had plenty of work to do when it comes to decision making and accuracy. The Browns have revamped their offensive line, they have a strong rushing attack and there are plenty of options to throw to. Kizer is competing with Cody Kessler and Brock Osweiler (for now) for the starting job. Bonnie Watt, from Bucs Wire/USA Today, believes quarterback Jameis Winston is destined to make a big leap in 2017. Winston has thrown for over 4,000 yards in each of the last two years, the first quarterback in NFL history to do so. The Bucs added quality weapons to the passing game this offseason, and the passing game could be incredibly healthy this season. Winston could post MVP-type numbers in 2017. He's that good, and the Bucs certainly have a formidable group of weapons around him. From a fantasy perspective, Winston is a QB1 sitting at QB11 (9.04) in 12-team PPR leagues. Buffalo Bills WR Sammy Watkins (foot) is unlikely to be ready for a full workload when training camp begins. Watkins had surgery to repair his foot back in January. He hasn't played a full season in two years, and the Bills are wise to ease him into action. The team didn't pick up his fifth-year option, and Watkins has millions of reasons to play up to his amazing potential in a contract year. Jared Dubin, of CBSSports.com, reports Houston Texans head coach Bill O'Brien says rookie quarterback Deshaun Watson won't be limited in the offense. "We put a lot on his plate during the spring, and he handled it very well," O'Brien said, per the Houston Chronicle. "He made mistakes, and he corrected them. You don't see him make the same mistake twice. He can do a lot of things. He can operate our running game and in our passing game. He's got a lot of athleticism. I don't think we'll have to limit him. Training camp and preseason games will be a big test." We feel Watson starts for the Texans this year. He's competing with veteran Tom Savage for the starting job in training camp. Watson doesn't have a rocket arm and he'll throw the ball up for grabs sometimes (too often). However, he plays biggest in the brightest moments and has ice in his veins as a passer. With that defense and the weapons around Watson on offense, the Texans should push for the playoffs in 2017. Denver Broncos QB Paxton Lynch 'played with greater fearlessness' and made significant strides over the final two weeks of the team's offseason program, according to Mike Klis of 9News Denver. Lynch is tall (6'7") has a rocket arm and the athleticism to be a threat as a runner. He's competing with last year's starter Trevor Siemian for the main job with the Broncos in 2017. The competition begins in training camp and Lynch was surging before the break. Lynch wants to go deep, and he was connecting on long passes with Demaryius Thomas and Emmanuel Sanders often in mincamp. He needs to be better when it comes to throwing with touch/timing on short routes if he wants to win the job. Detroit Lions head coach Jim Caldwell said he believes RB Zach Zenner can be an effective option for the Lions this season because of his skill set and his steady improvement. 'He can run the ball. He can pass protect. He can catch the ball out of the backfield if need be and I think just another year under his belt is going to be a great help. Zach is one of those guys that I think without question can be effective for us,' Caldwell said. Zenner is more than just a fullback, but how much more remains a mystery. He is a power back who can catch effectively out of the backfield. Zenner will be the Lions no3 back if he can beat out Dwayne Washington. Graham had a bounce back season in his second year with the Seahawks in 2016. The team figured out how to use him properly, and QB Russell Wilson developed an incredible rapport with the veteran tight end. Graham could built off the momentum he established last year, and he's currently going off the board at TE5 (6.07) in 12-team PPR leagues. John Keim, from ESPN.com, reports that both Rob Kelley and rookie Samaje Perine will lead a solid rushing attack for Washington in 2017. In their last two home games of 2016, Washington faced Carolina (ninth in yards per attempt) and the New York Giants (second). They managed a combined 67 yards on 28 carries. They just weren't good enough versus top run defenses and that could change this season. Fantasy owners need to monitor this situation in training camp. Both backs will be used, and Washington should also use Chris Thompson as a receiving back. Kelley wore down as the season went on last year, while Perine is a powerful rookie who reminds everyone of Michael Turner (Falcons). Right now, Perine (RB36) and Kelley (RB41) have virtually identical ADPs in 12-team PPR leagues. Kyle Silagyi, of Billswire/USA Today, reports Buffalo Bills rookie wide receiver Zay Jones has high praise for the offense. In a recent Facebook Live chat, Jones said "I would say 'explosive,' with all the weapons that we have right now, with Tyrod, Sammy, and [LeSean] Shady [McCoy] especially. Also 'dominant,' with our O-line and the running game that we have." Bills offensive coordinator Rick Dennison has been a part of some productive offenses, mostly during his time in Houston as OC under Gary Kubiak. The system is structured around zone blocking and play action passing. Jones finished his college career at East Carolina as the FBS all-time leader in receptions. He's clearly talented and extremely driven. If Sammy Watkins struggles with injuries again this year, Jones could have an opportunity to do more. Jones should only be a consideration for fantasy owners as a late-round lottery ticket. Dave Birkett, of the Detroit Free Press, reports the Detroit Lions are relying on both Zach Zenner and Dwayne Washington in their running back rotation. Ameer Abdullah is the team's starter, and Theo Riddick should continue as a primary receiving weapon out of the backfield. However, Zenner and Washington both showed promise in limited reps last year. Detroit's backfield is going to be ....interesting in 2017. Abdullah should be the lead back and he could turn some heads with his flashy skill set. However, he's small and has been banged up quite a bit as a pro. Riddick is a RB3/flex option for fantasy owners. Zenner and Washington have size the other two don't have, but they'll essentially be splitting touches in a limited rushing attack to begin with. Dynasty owners should have love for Zenner and Washington but redraft owners are unlikely to be rostering either back unless injuries hit on the depth chart above them. Indianapolis Colts TE Darrell Daniels was praised by general manager Chris Ballard for his performance during OTAs. Daniels was a converted wide receiver in college at Washington and stands out on the field due to his long arms and large hands. He needs to be better as a route runner and a blocker, but Daniels is a receiving weapon who could use some seasoning on the practice squad. Indianapolis Colts RB Dalton Crossan did 'everything right every day' during OTAs, according to general manager Chris Ballard, and Kevin Bowen of Colts.com believes Crossan could compete with RB Josh Ferguson for a roster spot if the Colts decide to keep four running backs. At 5'11" 204 pounds, Crossan was an impressive player during his college career at New Hampshire. He's fast but it takes him some time to throttle down and change direction. Crossan is best used as a player in space, slot receiver or receiver out of the backfield...plus he's got returner experience on special teams. Indianapolis Colts RB Marlon Mack (undisclosed) missed minicamp with an undisclosed injury, but Stephen Holder of the Indianapolis Star doesn't believe the injury is serious. Mack is competing with Robert Turbin to be the primary backup to Frank Gore in 2017. The rookie from USF is swift and can break off big plays in the blink of an eye. He's got straight-line speed but takes some time to change direction and he's not disciplined running inside. Too often for the Bulls, Mack would bounce runs outside to no avail. He should learn quickly that 'taking it to the corner store' doesn't work that much in the NFL. Tampa Bay Buccaneers FS J.J. Wilcox (undisclosed) and S Justin Evans (undisclosed) missed a majority of the offseason workouts because undisclosed injuries. It's not hard to imagine Wilcox and Evans as the starting safety duo for the Bucs when the regular season opens up. Chris Conte and Keith Tandy are expected to open training camp as the starting safeties, then the battle for those two spots shall begin. Tampa Bay Buccaneers FS Chris Conte and S Keith Tandy are expected to open training camp as the starting safeties. That's what the Bucs had to do with both J.J. Wilcox and rookie Justin Evans banged up during minicamp. It will be interesting to see this battle unfold during training camp. Earlier this offseason, the Bucs made Wilcox the team's highest-paid safety with a two-year deal worth $6.25 million, including $3.125 million in guaranteed money. Evans was the team's second-round pick in the 2017 NFL draft, and coming out of Texas A&M he's known as a tremendous athlete with extreme passion for the game. Indianapolis Colts RB Dalton Crossan, TE Darrell Daniels and CB Dante Blackmon are considered three players to watch from the team's undrafted free-agent class, according to Kevin Bowen of Colts.com. At 5'11" 204 pounds, Crossan was an impressive player during his college career at New Hampshire. He's fast but it takes him some time to throttle down and change direction. Crossan is best used as a player in space, slot receiver or receiver out of the backfield...plus he's got returner experience on special teams. Daniels was a converted wide receiver in college at Washington and stands out on the field due to his long arms and large hands. He needs to be better as a route runner and a blocker, but Daniels is a receiving weapon who could use some seasoning on the practice squad. The Kansas City Chiefs are planning to interview ESPN analyst Louis Riddick for their vacant general managerial position next week, according to multiple sources. He's one of the smartest football analysts out there. The Chiefs are run by Andy Reid, and any new general manager will have to have a good working relationship with the veteran head coach. Riddick previously served as the director of personnel for the Philadelphia Eagles and was there for most of Reid's tenure in Philadelphia. Dallas Cowboys TE Rico Gathers is still making mistakes as he improves his understanding of the game, and David Moore of the Dallas Morning News believes Gathers will likely be fighting for one of the final spots on the roster. A sixth-round pick out of Baylor in 2016, Gathers never played college football. He was a basketball player with the size/athleticism combination (6'8" 275 pounds) that pro teams love to consider as tight ends in the NFL. Gathers is still learning the position, and it looks like he's got quite a way to go before making much of an impact on the field for the Cowboys. Carolina Panthers WR Devin Funchess didn't receive enough targets last year, according to head coach Ron Rivera, and general manager Dave Gettleman agreed that Funchess wasn't used properly. Funchess suffered a sophomore slump in 2016, and he's looking to bounce back this year. It's going to be difficult to 'break out' given the collection of talent the Panthers added this offseason. Rookie RB Christian McCaffrey is a big play runner and a fantastic receiver out of the backfield (or the slot). Rookie WR Curtis Samuel has 'adios' speed and can turn short passes into long gains. We can comfortably project Funchess for 40-ish catches in 2017. That'll do it for today. Thanks for hanging out with us and thanks being part of Footballguys. We'll see you tomorrow with the Update. And thanks Boise, Idaho. It's been real.